There is no definitive source for what tool bag or tools came with a specific car unless you bought it new and kept everything intact. 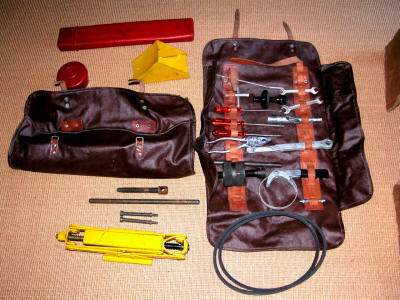 Most cars came with a one piece bag with an extension flap area for the jack and hub puller. However, I know that some of the late Mark II cars came from the factory with two bags like the 365 model. One bag held the tools and the other, the jack and hub puller. As these pictures are for the later 365 model car, not all tools apply to the 330 GT. Further, there are some that are not shown that would have been with a late model 330 GT kit. There's a web page for each tool that has more details, usually with a picture of an original. As I said above, there's no way of exactly knowing what was in your original tool kit unless you bought the car new or the original owner took pictures of it. 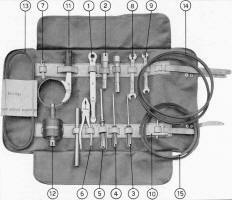 There are some inconsistencies between the 1 piece tool kit and the 2 piece one as described above. 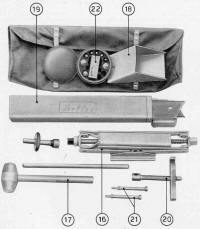 Should there be 4 screwdrivers as described in the 1 piece kit or 3 screwdrivers as described above? 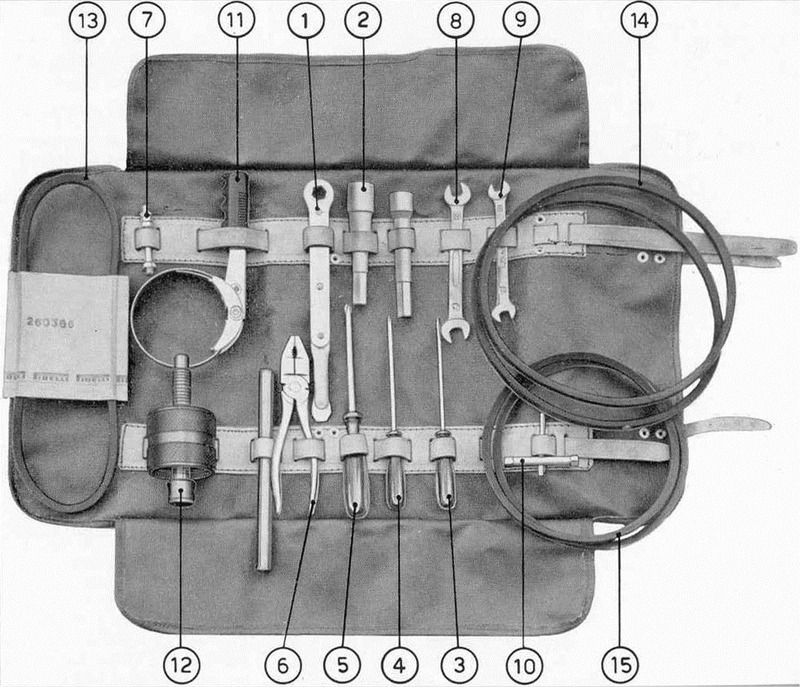 Should there be a grease gun and flexible hose? Should there be a steel hammer? Should there be a full (7) set of open end wrenches or just the 2 described above? What does the smaller 17 mm socket fit? If anybody has definitive answers to any of these questions, please contact me. 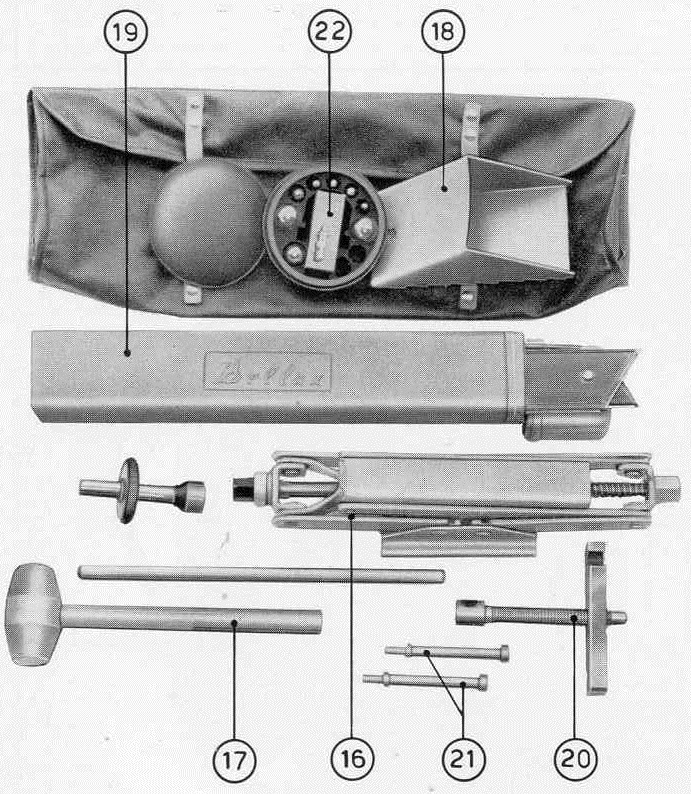 Here's an original 365 tool kit. The spark plug socket is a swiveling type instead of the two individual ones. The swiveling extension (top tool in right bag) has a magnet on the end and is not original. No lead hammer is shown, but the owner said that he forgot to put it in.. The flat plate for the rear hub puller is there, but almost hidden by the jack bag. The two wrenches are made in Germany by Gedore. This is how I've set up the twin bags for my late model 330 GT.